Hi everyone! It's time for another smart and healthy recipe. First I want to share some happy stuff. I am down from 150 to 146 lbs. Hopefully it will keep dropping. I can't wait until school is out so I can spend more days in the gym. This summer I will be working much harder to shed all of this weight I put on from having babies. Just to put it out there, my goal loss by the year 2014 is 30 lbs. I can do it. One last bit of great news, I have been struggling this semester. Human Physiology has been my toughest science course yet. I started out with a professor who was fresh out of grad school and had never taught before. She lectured everything individually and didn't tie it altogether to make it applicable. She left mid term, and while it was pretty stressful, I was completely relieved. The professor who took her place is brilliant at making the curriculum stick and make sense. We recently had our Unit 3 exam and out of his 4 classes three people made the highest score of 94%. I was one of those three, so YAY! I feel smart again. Ha. Now. About this recipe. This recipe comes out of a cookbook I got recently to help get more "superfoods" in my diet. The book is called "Superfood Kitchen" and it is authored by Julie Morris. I can't vouch for all of the recipes, but it is full of awesome information about all the superfoods. One of the most difficult things about eating healthy is cutting down the refined sugar intake and finding healthy things to satisfy the sweet tooth. This recipe does that. Baking these refreshing, filling, sweet-tooth satisfying treats up is not as simple as whipping up a batch of chocolate chip cookies. Zesting a whole lemon peel and chopping up dates is time consuming and exasperating, but I am always happy I took the time to do it. The kids love them too. 3/4 C + 2 Tbsp shredded dried coconut, divided. 1/2 C soft Medjool dates (about 5 or 6) pits removed. Preheat your oven to 300 degrees. Lightly grease an 8x8 inch baking pan. Zest the lemon to get 2 Tbsp worth. Set aside. In a small bowl, mix the chia seeds and lemon juice together. Put this aside so that the chia seeds will soak up the lemon juice and plump up. Stir once at 10 minutes. While the seeds are soaking, get a medium mixing bowl, mix together the oat flour, baking powder, salt, and 3/4 C of coconut flakes. Sprinkle in the the lemon zest and mix well. In another mixing bowl mix together the coconut oil, apple sauce, and maple syrup or agave nectar (I use agave nectar). Add in the chia seed/lemon juice mixture and the chopped dates. Pour the wet ingredients in with the dry and mix well with a spatula or spoon. Spread the mixture into the baking pan using the spatula to flatten the surface. Sprinkle the top with the last bit of coconut flakes. Press lightly into the mixture. Bake for 25-28 minutes. While it is still warm cut into bars or squares. What size you make them is up to you. The book says to cut them into 12 - 16 squares. HA! I didn't get that many out of it ha. Before I jump into talking about the recipe I wanted to share some helpful nutrition facts that you might like a lot if you haven't heard it already. This little tid bit is about our favorite "guilty" indulgent... Chocolate. When I see friends trying to diet or eat healthy, one of the biggest things they complain about is not eating chocolate... and my question to that is "Why?" Stop avoiding chocolate... especially dark chocolate!!! The more cocoa it has in it, the better. Do you wonder why when you are upset or about to enjoy the visit of Aunt Flo, you crave chocolate? This is because it is chock full of antioxidant and natural stress relievers.. and if you are a chocolate eater, your body knows this. Important to take note of, is a purer form of cocoa which is cacoa. Cacoa is minimally processed at low temperatures to preserve a lot of the plant's natural health benefits. Cocoa is roasted or processed, so it loses some of those benefits during that process. Cocoa is what most, if not all, of the chocolate bars in the world are made with, but still, while the health benefits decrease with this process, it still contains health benefits. If you are really adventurous and want the full benefits, go to your health food store and get some cacoa nibs or cacoa powder. There are plenty of recipes out there to utilize this purer form of chocolate and you can get crazy amounts healthy goodness from it. Bottom line, don't deprive yourself of something so wonderful. Moderation and limit milk chocolate intake, but don't beat yourself up over eating chocolate. It does your body good. With being high in iron, calcium, mood elevating phytochemicals and amino acids... how can you go wrong? 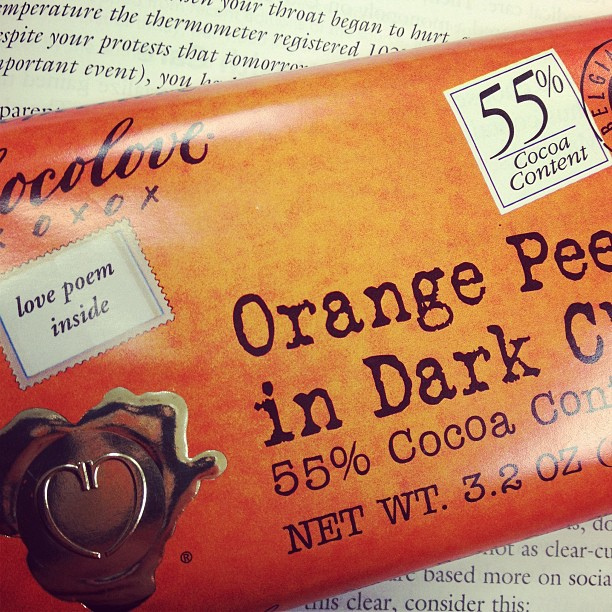 My favorites right now are Chocolove Orange Peel in Dark Chocolate and Green&Black's Organic Maya Gold Dark Chocolate. I eat a piece everyday... and I don't feel guilty. P.S. I am down another 2 pounds since my last post. First of all... chicken and fajitas are actually contradictory. Fajitas, I guess, means skirt steak... and chicken isn't skirt steak, but I don't know any other way to describe this dish than call it Chicken Fajitas, ha. So if you are someone who gets annoyed by the myth that is chicken fajitas, please forgive me ha! A lot of times I forget about the whole marinating stage and then I just skip fajitas altogether... but this time I said to heck with it and ended up making the best fajitas I have ever tasted. It is one of our favorite meals now. Slice the chicken breast against the grain into 1/4 inch strips. Sprinkle with the chili powder, garlic, salt and mix together. If you want to marinate them, do this in the morning, add half a lemon sliced (all parts) and some olive oil to the spices in a glass dish that has a lid, mix well and allow to marinate while you are at work or doing what you need to do... if you don't marinate, DON'T sweat it... I NEVER marinate. It doesn't sound like a whole lot of seasoning, but that is what I like about this dish. The flavors are fresh and not overwhelming... the good think is that if you like a lot of seasoning, you can add it. Okay, heat up your skillet to medium high. Prep your toppings which is the cilantro, lime, green scallions, avocado, and cheese. Add a splash of olive oil or coconut oil to your skillet and throw in the chicken and cook for about 2 minutes on each side. Add your peppers and onions. Cook for about 5 minutes tops. You want the peppers to maintain a crispness. Set aside. Heat up your tortillas however you like. I usually put them on a plate covered by another plate and heat them for about 30-45 seconds in the microwave. Now you are ready to serve. Heap a spoonful of the fajita mix into the tortilla, top with a big pinch of cilantro, green onion, some avocado, squeeze the lime on top of all that, and enjoy. So delicious. Side note... cilantro is GREAT for detoxing the body of harmful metals like mercury! Cilantro is VERY good for you, and it adds so much delicious flavor! So eat up! It is a lot more difficult finding time to blog than I thought it would be. I have so much happening with class right now. Tests and papers are due left and right. I am actually procrastinating on putting some finishing touches on my research paper to blog this. So far I have lost 3 lbs after one week of changing what I put into my body. I have so many recipes to share, and they will be geared toward the busy mom who wants to make some healthy changes. I mentioned the water and I hope you all have begun to take hydration seriously. It's so vital to your metabolism. I am on day 12 of hydration and I feel a lot better for it. The recipe I am going to share is actually a recipe that an instagram friend posted, but I tweaked it a bit. Breast cancer runs in my family and I have to be extra careful with consuming phytoestrogens, which means that I try not to consume a lot of soy or flax seed. This recipe orignially calls for a 1/2 cup of flax seed... but since it has phytoestrogen I changed the recipe to include a little bit more oatmeal and a tablespoon of chia seed, which is as benifitial as flax seed, only it doesn't contain the phytoestrogen. 1 1/2 cup of organic rolled oats. Mix together all ingredients until they are well incorporated. If you like the sweet and salty taste feel free to add a pinch of salt. Get a small cookie dough scoop and roll into balls and place in a container. Then place in the refrigerator for at least 15 minutes to firm them up. These are great for a quick snack or breakfast. They take the place of pop tarts for my kids. They love them. Quick and Yummy Chicken Fajitas... Tabouleh... Pesto Whole Wheat Pasta... Coconut Lemon Breakfast bars. Happy Healthy Eating... and "Eat like your life depends on it, because it does." Hi there! Hopefully some of you are still out there. I took a little blog hiatus. I plan on blogging more in the near future. I will likely start this weekend. I've made some huge changes in my life health wise, and I want to share them with you. Look for a far more in depth post this weekend. This blog will be an inspiration and collaboration for anyone who is shifting their primary means of attaining nutrition from the highly processed and industrial farm produced food to more of an organic, natural, local approach to food and nutrition. I will be posting ideas, recipes and sharing about any weight loss and health benefits that I am noticing. The first thing I want to share about is water. It's so important to be properly hydrated, and I can honestly say I have only been properly hydrated for about 1% of my life so far. I started using an app that I was introduced to by a friend. It is called Water Your Body, and it is a great motivator. It also helps to have a pretty and chemical free container to drink your water from. When you like your water bottle, you'll want to take it with you everywhere and drink from it. I love my lifefactory waterbottle. So, I guess I should say that the first step to good health is drinking enough water. My weight means that I need to drink 74 oz. a day. When you drink water it helps your metabolism (hydrolysis)... it cleans you out... carries out some toxins. Drink water. See ya this weekend with a recipe.